If you have a child under 3 years old, the packaging says this harmonica is unsuitable. 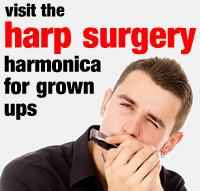 We say if you have a child of any age, this harmonica is unsuitable. Save your money, even if you have a pre-schooler who’s into Peppa Pig. This product is purely and simply a branding exercise. It has no musical value whatsoever. To the point that many of the notes don’t even play. We’ve read through consumer reviews on line (see below) and feel that anyone giving positive feedback is either fictitious, or else simply doesn’t understand what a harmonica should do. If you wish to read any further, here’s what we found. The individual blister presentation pack has plenty of Peppa Pig branding and harmonica colour choices are pink, yellow or blue. There is a separate cardboard box enclosed in the packaging, which is listed as a ‘storage case’ on one website we visited. In reality it’s a vehicle for further branding, just a filler, and it’s sure to be crushed or binned within minutes of purchase. As soon as we tried to play the harmonica, we realised something was amiss. We were presented with sixteen holes, but there was no visual indication of which way was up (such as hole numbering). However, a quick toot located the lower and higher pitched reeds, and confirmed that this was not a tremolo harmonica. From here on though, it was hard to tell whether this was a regular diatonic, solo or chord style harmonica. We could just about find an arpeggio across the first four blow holes in a badly off-pitch E major but, despite extensive experiment, that was it. And the response in the fourth hole was so leaky it had no practical use. The first four draw holes gave an ersatz tremolo effect as they were all tuned to the same note; a badly off-pitch B major. Or was it Bb? We gave up trying to make sense of the rest. Having removed the covers, it became apparent that instead of each air channel housing its own blow and draw reed, with separate reed plates for the blow and draw reeds respectively, there were in fact sixteen reeds staggered along a single reed plate. This means the blow notes are housed in the odd holes, while the draw notes are housed in the even holes. Which is why it impossible to play anything of consequence. Furthermore, every single note is off pitch and leaky, or else totally unresponsive, and there is no apparent logic to the reed tunings individually or collectively. 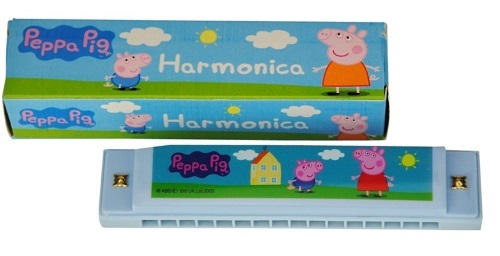 The Peppa Pig harmonica is imported from China by the HTI Group in Fleetwood (www.time4toys.com), Lancashire, and frankly they should be ashamed of themselves. We understand the principals of branding. 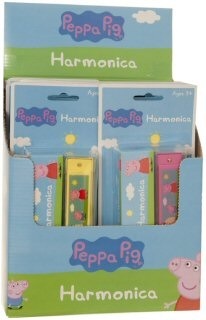 We understand it can be fun to own your own Peppa Pig harmonica, guitar or recorder. But long term, this harmonica has absolutely no musical value and it’s more likely to put children, parents or well-meaning grandparents off the harmonica for life. In conclusion, even at £1.75 on e-bay, it’s a complete waste of money and not worth its own carbon footprint. We would like to meet whoever is responsible for endorsing this pig’s ear! The Argos website is the only one that affords the Peppa Pig harmonica any sales jargon: Have hours of fun with this Peppa Pig Harmonica! This harmonica can offer your child hours of entertainment while developing their musical skills. Excellent gift idea! Comes with storage case. No, that’s a flimsily branded cardboard box, not a storage case. And the only musical skill it will offer is the percussive effect of using it to hit whoever bought it for you. Meanwhile there are two customer product reviews on the site, one of which reads: It’s not good enough as a toy for its price. You’ll expect better. No sales jargon on the Next website, just this review: Little one likes to play the harmonica, but after 5 minutes the peppa pig imagery started to come off, as little one had used her teeth to hold on to the harmonica while playing it. Also one end of the instrument doesn’t produce a tone (well, I managed it just about by blowing very hard). Again, no sales jargon on the Amazon website, but quite a few reviews, including these negative reviews: My daughter is 3 and can make no sound from this at all. Even with an adult putting in MAXIMUM effort the sound is minimal. Complete waste of money and in the bin. / My son loves it, but after a day of using it it’s not playing the sounds properly. Still it was bought for a kid so I didn’t expect much more. / The harmonica is cute, for kids who like peppa. But, as an instrument it is not good, comparing to a regular harmonica. / It does not sound at all! My four year old daughter was very frustrated trying to use it!But I suppose is what you get for the price you paid!